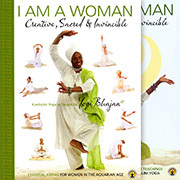 The yoga sets found in Yogi Bhajan's Kundalini Yoga for Youth and Joy will leave you feeling healthy and energized, with a renewed enthusiasm for life. Strong, flexible and radiant bodies need not be young in years, just as stiff, slow and fragile bodies need not be advanced in age. An aging body is a body out of tune and out of shape, and most often results from an inability to handle the mental and physical stresses of the modern environment.